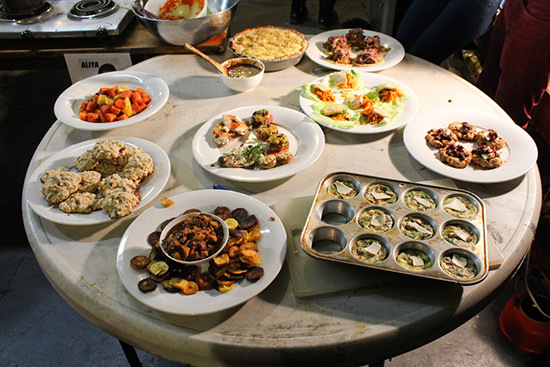 A couple of Saturdays ago I had the honor of judging Flux Factory’s second or third Iron Chef Contest. The exact number isn’t important—Fluxers aren’t concerned with accuracy so much as getting the job done. Iron Chef judges (myself included) were told to look for “fluxiness” in the “Fluxers.” While it was never fully defined, the meaning quickly became apparent: it’s the creative cajones required to make do with what you have. When showcased effectively, as it was that evening, fluxiness is both terrifying and exhilarating. Most of the night was a blur. 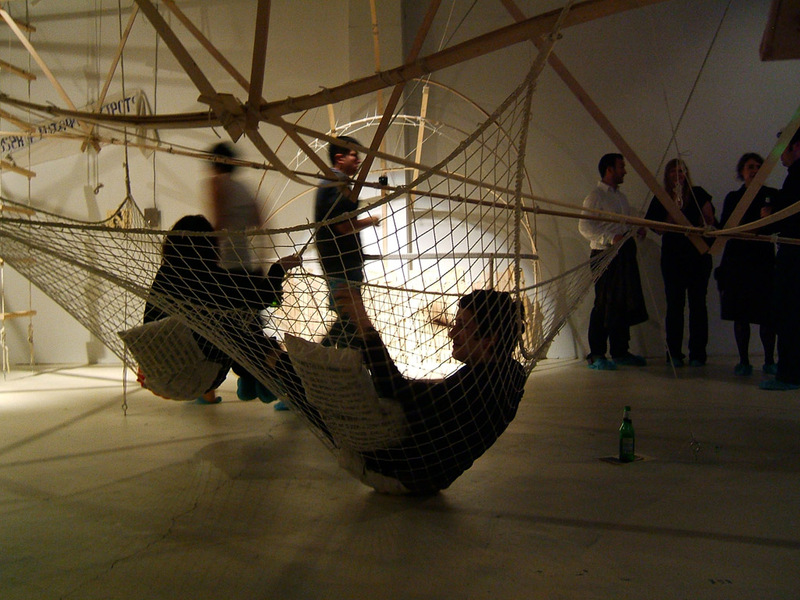 Flux Factory residents Georgia Muenster, Aliya Bonar, Theodoros Zafeiropoulos, Stephanie Avery, and Nick Cregor competed for an absurd trophy: a yellow sponge with glasses, a fake nose, and a whisk for hair. They took the challenge seriously. Underneath a chicken disco ball, we watched a flurry of activity on countertops and stoves. Either to calm our nerves or to fuel the excitement, judges were supplied with drinks that tasted like hot sauce bathed in 180-proof liquor. Needless to say no one drank much. Right away, Aliya Bonar, a sculptor who specializes in DIY costume design, promised to make some savory raisin cookies and tofu something-or-other. About 15 minutes in, we watched her drop the cookie dough on the floor in her hurry and toss it back in the bowl; “she’s a wild card for sure,” I thought. Then, scrambling for a food processor and not finding one, she just smashed a pile of almonds with a teapot. Stephanie Avery, a graphic artist and designer, maneuvered the stove/counter/kitchen like a pro and announced she’d be making raisin cookies, Tsimmis (a stewy dish with a lot of carrots), and an apple-ginger chutney. Ambitious! Flux’s curatorial fellow Georgia Muenster presented just one dish: a banana cream pie with raisin reduction. I nearly forgot about her as she worked so quietly at the back of the kitchen. Finally, land artist and sculptor Theodoros Zafeiropoulos lit his stove on fire while roasting eggplants (it was on purpose and extinguished quickly) and performance artist Nick Cregor said he had no idea what he was making before he hollered for a fork. Ultimately, he scraped together a flatbread dish topped with a black-bean-and-raisin mash and sauteed onions. With lowered expectations, I was pleasantly surprised to find the dish delicious. As some readers may have surmised from the quality of my descriptions, I’m about as much of a dining critic as these artists are America’s next top chefs. I was qualified to judge this contest because I’ve eaten food in the past, and the Flux chefs qualified to participate because they’ve made some. Expertise wasn’t as relevant to this competition as getting out of our comfort zones and exercising the muscles we use every day when making art or writing criticism. And so, when the (painfully sober) judges Steven Stern, Harriet Taub, Tracy Candido and David Shapiro thought about what it might mean for a dish to be fluxy, we tried to award points to artists who had been the most creative in their problem solving. Dark-horse contestant Georgia Muenster came very close to winning for having the guts to present only a dessert. It didn’t hurt that her pie was delicious. In the end though, Aliya Bonar went home with the trophy sponge, not just because she managed to make a savory oatmeal raisin cookie topped with cheese taste really amazing, but because she went the extra mile for it. Crushing whole almonds theatrically, with a small teapot, probably isn’t art. But the thinking that lead to that decision is certainly part of it.